The dominant contemporary narrative around urban transformation seems to be divided along a clear binary. On the one hand, there is real estate development and speculation which treats land as like any other asset to invest in; on the other hand there is conservation, which wants to protect land and architecture from destruction and development. urbz has an old and ongoing association with Khotachiwadi, which has been at the center of the tug of war between these two extremes for many years. Part of our work involves asking the questions – what does it mean for a space to be conserved? How is a space “protected”? Consistent with our approach in other neighbourhoods also, urbz has tried to focus on local economic activity and potential in Khotachiwadi, and how these can offer an alternate kind of resistance to destruction of the century-old Portugese-style bungalows. Conservation efforts towards the architecture of Khotachiwadi have long been the focus of parties outside Khotachiwadi; it is imperative that any visions towards a more “conserved” space need to be contributed to by the actual residents and users of the space. Khotachiwadi is unique not only for its heritage bungalows, but for its entire fabric; the diversity of its typology is linked to the diversity of its demographic. In South Bombay, which is fast gentrifying and calcifying, such spaces are especially precious. Socially, culturally, and economically successful cities necessarily support this heterogenity that Khotachiwadi is a natural home to. It is this diversity that should be the true focus of “conservation” – not exclusively the architecture. Architecture is innately human; once we realise that the purpose of “conserving” or preventing the death of spaces should essentially be about the need to prevent the death or evacuation of certain structures, activities, or communities – we can rethink the meaning of conservation. Perhaps spaces are “conserved” when they are dynamic, open to spontaneity and change. 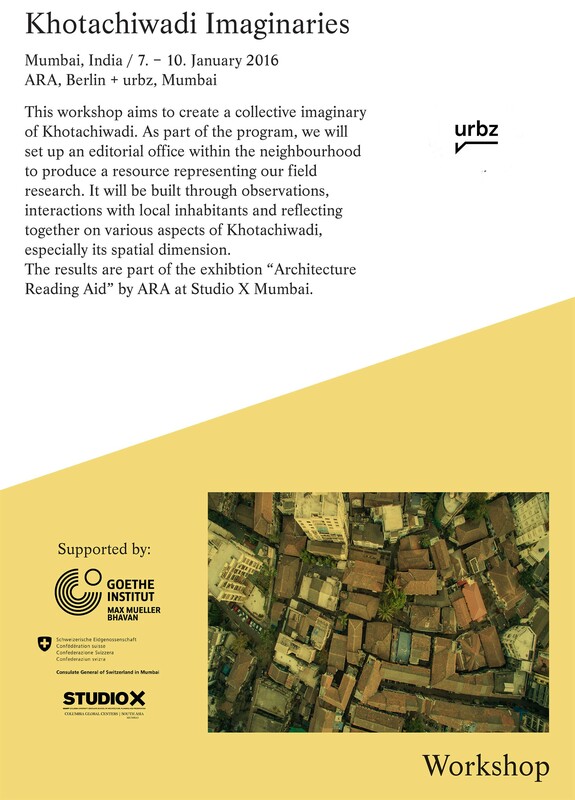 It is with this thought that we are holding a workshop in Khotachiwadi, open to the public, to collaboratively envision a transformed Khotachiwadi and the ways in which the neighbourhood can resist complete destruction and redevelopment. The event will be held from January 7-10 2016, in association with the Khotachiwadi Welfare Heritage Trust. The main guests for the event will be four architects and designers who are here for the launch of their recent book on Ahmedabad’s urbanscape (see excerpt here). The ongoing output of our work in Khotachiwadi has been compiled into a report that will also incorporate the output of the workshop. Do visit the event’s facebook page if you are interested in participating. Please note that registrations are limited. We hope to see you there!